HINCKLEY, Minn. (Jan. 14, 2019) — Rob “Bravo” Brant upset the odds to win a world title. For title defense number one, he’s returning to his favorite stomping grounds. Brant, a native of St. Paul, Minn., will defend his WBA middleweight title against the unbeaten Khasan Baysangurov on Friday, Feb. 15 at Grand Casino Hinckley. Brant, who stunned Japanese superstar Ryota Murata Oct. 20 via unanimous decision to win the title, will be making his 12th professional appearance at Grand Casino Hinckley. Rounding out the ESPN-televised tripleheader will be rising bantamweight star Joshua Greer Jr. defending his WBC Continental Americas belt in a 10-rounder versus Giovanni “Little Giant” Escaner and female fighting sensation Mikaela Mayer making the second defense of her NABF super featherweight crown in an eight-rounder versus Yareli Larios. Brant-Baysangurov, Greer-Escaner, and Mayer-Larios will be televised live on ESPN and ESPN Deportes at 9 p.m. ET. The entire undercard will stream live beginning at 6 p.m. ET on ESPN+ — the new multi-sport, direct-to-consumer subscription streaming service from The Walt Disney Company’s Direct-to-Consumer & International segment in conjunction with ESPN. Promoted by Top Rank, in association with Greg Cohen Promotions and Rapacz Boxing, tickets priced at $50 (reserved) and $35 (general admission) go on sale Saturday, Jan 19 at 10 a.m. CT and can be purchased at any Grand Casino MN box office, online at Ticketmaster.com, or by calling Ticketmaster at 800-745-3000. Brant (24-1, 16 KOs) turned pro in 2012 following a standout amateur career that included a bronze medal at the 2012 U.S. National Championships (178 pounds). He moved down to middleweight to begin his pro career and soon became a gate attraction in Minnesota. He was riding a four-bout knockout streak in 2017 when he moved up in weight to enter the World Boxing Super Series super middleweight tournament. Brant was bested via unanimous decision by former light heavyweight world champion Jürgen Brähmer in the tournament quarterfinals. Following the Brähmer defeat, Brant returned to the middleweight division, knocking out Colby Courter in the opening round on March 9 of last year at Grand Casino Hinckley. 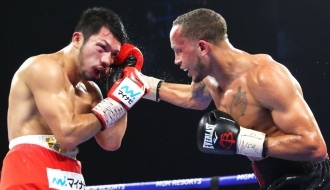 Against Murata, at the Park Theater in Las Vegas, Brant threw an astounding 1,262 punches, snatching the title from the established champion in one of the year’s great performances. He returns to Hinckley intent on continuing his streaking momentum against Baysangurov (17-0, 7 KOs), a 21-year-old who turned pro at 16 years of age. A former Russian amateur standout, Baysangurov captured the vacant WBA Intercontinental middleweight belt last May with a 12-round decision win against Guido Pitto. He defended the belt in October in Kiev, Ukraine, with a unanimous decision victory versus Paul Valenzuela Jr.
Greer (19-1-1, 11 KOs), the 24-year-old Chicago native with the big smile and the bigger punch, is aiming to extend his knockout streak to seven. He went 4-0 in 2018, including a third-round stoppage of Giovanni Delgado on Sept. 28. In his last outing, Dec. 14 in Corpus Christi, Texas, Greer captured the vacant WBC Continental Americas belt when Daniel Lozano remained on his stool following the seventh round. Greer, as always, will have a custom pillow on hand, which is unveiled after he knocks out his opponent. Greer debuted the pillow after he knocked out James Smith in what was a 2017 Knockout of the Year contender. Escaner (19-3, 13 KOs), a 28-year-old Filipino contender, has won eight consecutive fights and will be making his American debut. Mayer (9-0, 4 KOs) represented the United States at the 2016 Rio Olympics and is one of the leading names in female boxing less than two years since making her professional debut. She won the NABF belt with a unanimous decision over Vanessa Bradford Oct. 13 on the Terence Crawford-Jose Benavidez Jr. undercard in Omaha, Neb. In her last but, Dec. 14 in Corpus Christi, Texas, she shut out Calixta Salgado over eight rounds. Larios (13-1-1, 3 KOs), a native of Guadalajara, Mexico, is a seasoned pro who has gone eight or more rounds six times. The ESPN+ undercard will feature a slew of top contenders and prospects. Unbeaten light heavyweight prospect Steve “So Cold” Nelson (12-0, 10 KOs), a stablemate of pound-for-pound elite Terence “Bud” Crawford, will battle Felipe Romero (20-16-1, 14 KOs) in an eight-rounder. Ismail “Sharp Shooter” Muwendo (20-1, 12 KOs) will face Colombian puncher Hevinson Herrera (24-15-1, 18 KOs) in an eight-round lightweight contest. One the sport’s top young middleweights, Tyler Howard (16-0, 11 KOs), will seek to extend his knockout streak to three versus Cristian Olivas (16-3, 13 KOs). Lightweight prospect Albert Bell (13-0, 5 KOs) will take on the durable Edward Kakembo (10-6, 3 KOs) in an eight-rounder. Kevin Cruz (8-1, 5 KOs) will look to bounce back from his first pro loss against Minneapolis native Rondale Hubbert (12-8-1 7 KOs) in an eight-round lightweight fight. Unbeaten super middleweight Cem Kilic (12-0, 7 KOs) will see action in an eight-rounder against an opponent to be named. Lorenzo Simpson (1-0, 1 KO), an 18-year-old Baltimore native, will showcase his talents in a six-round middleweight bout. Use the hashtag #BrantKhasan to follow the action on social media.